The speed bumps near the school might be slowing traffic down but they would appear to be too high. If your car is `low slung` you could drive over them at 10 mph and still damage the bottom of your vehicle. There must be a `standard height` off the road for vehicles ? .... this is surely not correct; people are paying lots of money in road tax and, as can be seen in the image, their cars are being damaged by the very roads they are paying to use - presumably the Highways Department will pick up the repair bills ? Right of reply as always. probably make the road totally impassable for people with perfectly legal and road-taxed `low-slung` cars. to Land`s End and Sennen. Accident at the first westbound speedbump this afternoon - motorcyclist thrown off his machine and into the hedge. We understand the man was not badly hurt. Larry 24 July I actually rode down to Sennen on my bike on Sunday. I had forgotten about the bumps, but there is absolutely no excuse for a biker to bin it over them. There is plenty of space to do the “proper” thing and go inside them – and I ride a big touring bike. He was either not concentrating or riding like an idiot… There is no excuse for either. I see the dreaded "Let op! Dremples" sign, I slow down. A bit drastic I agree, but it works. 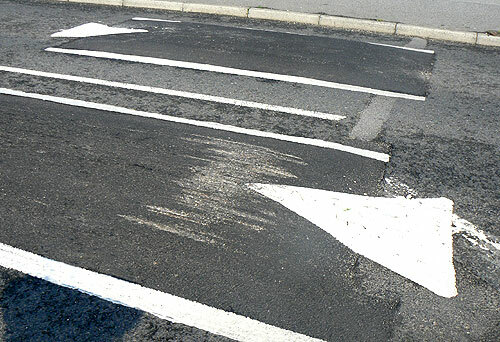 The maximum permitted height of speed bumps is 100 mm, but the Department for Transport recommends that speed bumps should generally be no higher than 75mm. It also publishes detailed guidance on their design to try to avoid vehicle grounding. This is all set out in Local Transport Note 1/07 - Traffic Calming - see pages 47 onwards, a copy of which is on the Department for Transport's website (http://www.dft.gov.uk/pgr/roads/tpm/ltnotes/pdfltn0107trafficcalm). Perhaps someone in Sennen would like to check the height of the bumps that have been installed, and get onto Cornwall County Council if they seem to be ignoring the law or the Department's guidance. There is a national campaign against speed bumps, for this very reason. car gets damaged or you suffer an injury make a claim.